Is your Check Engine Light on? 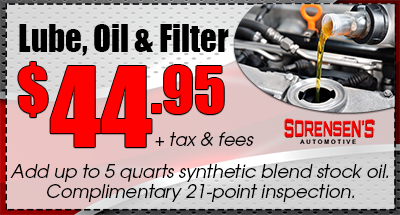 It’s time for a trip to the Engine Repair professionals at Sorensen's Automotive. Let our techs get your car’s engine running like the day you bought it. We pride ourselves on offering our customers the best in Transmission Service. Our auto repair shop offers everything from complex mechanical solutions to basic maintenance services. Accidents and other roadside emergencies can be frightening situations. Graham Towing is there for you when you need us most. Nothing is more frustrating than a mechanical failure. Sorensen’s Automotive has been repairing cars and trucks for over 50 years. If you have a failure on the road we offer 24 hour emergency towing and can get your car back on the road. When you bring your vehicle to us you can be assured that we will do our best to diagnose the issue given our years of experience and with the aid of computerized engine diagnostics. We will provide you a complete estimate. At Sorensen's, we provide a comprehensive list of auto repairs; including, engine repair, transmission repair, exhaust systems repair, front-end and suspension repair. Keeping your car maintained can add years of life to your vehicle. We offer all types of automotive maintenance; including, oil changes, vehicle tune-ups, brake service, cooling system service, transmission service, and alignments. “But it’s cheap.” That’s the excuse many people use for heading to an auto repair center with substandard workmanship. While you may save a few dollars initially; cheap is actually expensive.